The top US military commander, Gen Martin Dempsey, says he is concerned about "the potential for civil unrest" as Europe's financial crisis unfolds. Gen Dempsey said it was unclear the latest steps taken by EU leaders would be enough to hold the eurozone together, adding that a break-up could have consequences for the Pentagon. Twenty-six of the 27 EU countries have agreed to forge a tighter fiscal union. Only the UK refused to sign up to a new treaty, citing national interest. Gen Dempsey, who is chairman of the Joint Chiefs of Staff, told an event hosted by the Atlantic Council, a Washington think-tank: "The eurozone is at great risk." "I know that they've taken some measures here with the 17 members of the eurozone to try to better align... monetary and fiscal policy. But it's unclear, to me at least, that that will be the glue that actually holds it together." 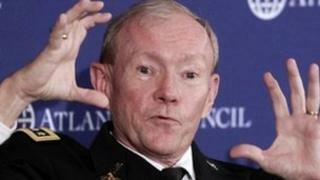 Gen Dempsey previously served as the Army's Chief of Staff and as a general in Iraq. The US military has more than 80,000 troops and 20,000 civilian workers in Europe, many based in Germany. Gen Dempsey also said he was concerned that an international project to develop the F-35 Joint Strike Fighter aircraft could be put in jeopardy if European national defence budgets were cut. "It will clearly put [budgets] at risk if all the economic predictions about a potential collapse were to occur," Gen Dempsey said. At an emergency EU summit that ended in Brussels on Friday, the UK effectively used its veto to block an attempt, led by the French and Germans, to get all 27 members states to support changes to the union's treaties. Instead, eurozone members and others will adopt an accord with penalties for breaking deficit rules. It will be backed by a treaty between governments, not an EU treaty. The announcement on Friday produced little reaction from financial markets, which are still hoping for more intervention by the European Central Bank (ECB). The BBC's Chris Morris says that without further action to lower the cost of borrowing, likely by the ECB, the eurozone still faces a threat. The rising costs of borrowing in some eurozone countries have pushed governments to pass new austerity measures and to the International Monetary Fund as they struggle to pay their debts. Europe's debt crisis has already unseated two political leaders and their governments: former Greek Prime Minister George Papandreou and Italian leader Silvio Berlusconi.